Stellar Video Player is a premium multi-purpose video player. Stellar player supports YouTube playlists/channels/single videos, Vimeo videos, self-hosted HTML5 videos (only mp4 required), Google drive videos, Dropbox videos, local videos, Amazon s3, LiveStreaming HLS m3u8 videos, basically everything that you'll need from HTML5 player. No coding or technical skills required. Lifetime support and frequent updates will ensure to make the most out of your purchase. Installation is super easy. Once you have downloaded the Stellar Player simply edit it's intuitive options. Stellar video player can play any youtube video , import youtube playlist or even youtube user channel . You can use default YouTube player or YouTube player with custom controls. Stellar video player has support for any Youtube 360 VR video, and even supports livestream videos from Youtube. Also, Stellar video player can play any video from vimeo too. Vimeo videos can be played with default Vimeo player or custom Stellar player. Stellar video player now supports HLS (HTTP Live Streaming) .m3u8 files. Stellar video player can play any video from Openload. Create your playlist with any video type you want ЁC mix YouTube/Vimeo/Self-hosted/GoogleDrive videos all in one playlist. Stellar video player supports pre-roll (before), mid-roll (during), post-roll (after), video ads and pop-up ads. For each video in playlist you can set own pre-roll/mid-roll/post-roll/pop-up ad. Also, advertising is improved with custom skip ad option, which means that you can set different skip time for each video. Each ad can be added for all video types that Stellar player supports: youtube single videos/youtube playlists/user channels, vimeo videos, and self-hosted mp4 videos. Stellar player supports deeplinking, meaning you can determine which video from playlist will be loaded when webpage loads. This feature gives you plenty possibilities. Also, you can set random video from playlist when webpage loads, which can also be integrated with random Video Ads. With integrated quality selector Stellar player provides user the best video experiance. With Stellar video player you can display your images or gifs, instead the video. This feature gives you option to use Stellar player like banner or image slider. You can even mix images with videos in the same playlist. Stellar video player can be showed in lightbox mode. You can set any image to open player in lightbox. Multiple lightbox images are supported (multiple lightbox players in same page). Lightbox options are: lightbox image, lightbox image width and height, lightbox close on click outside (optional), lightbox autoplay (optional). This way you can have multiple video players on the same page. Responsive mode creates Stellar video player that fits exactly into page or post content. With Fullscreen mode Stellar video player will cover the entire page. Stellar player look can be customised by changing the color accent to any color you like to make your player blend in to your website perfectly. Stellar video player is a HTML5 ready player that enables it to work on all platforms ЁC desktop & mobile. Stellar player is optimized for laptops with touchscreen as well. 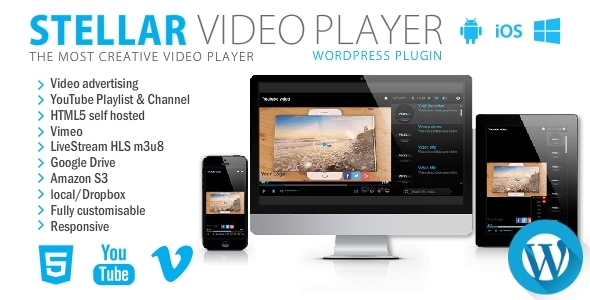 Stellar Video Player; Elite Video Player - WordPress plugin; Elite Video Player; Premium Video Players Bundle - 4 in 1; Ultra Video Gallery with Youtube, Vimeo, HTML5, Ads; HTML5 Video Player & Advertising - WP plugin; Ultimate Player with YouTube, Vimeo, Ads WP Plugin. Keywords: advertising, amazons3, customisable, google drive, HLS m3u8, html5 player, lightbox, media, mp4, playlist, responsive, video player, vimeo, youtube. Premium CodeCanyon Stellar Video Player Wordpress plugin 20939246 WordPress Themes, Website Templates, Mobile Themes, Flash Templates & Scripts from creative professional designers. Full details of CodeCanyon Stellar Video Player Wordpress plugin 20939246 for digital design and education. CodeCanyon Stellar Video Player Wordpress plugin 20939246 desigen style information or anything related.